A decade or so ago I had a job painting a ceiling in Rome… no not that one, the ceiling of the Hard Rock Cafe which I had to cover in flying rock stars reimagined as cherubs. Working in Italy was great fun, the builders after initially being a little suspicious called me “Maestro” and brought me lovely coffees and treats. So I spent several weeks lying on on my back up on a scaffold tower being wheeled about by my long suffering helper Paul. In Italy work starts early but finishes at 4pm which gave me ample free time to float about Rome painting and looking at all the wonders. One of those visits was to the Palazzo Doria Pamphili. I am embarrassed now by my ignorance, but I had not heard of it. I had just visited the Pantheon which was bombed out by hoards of tourists and was wandering home when I saw the sign and the entrance. It had that grand palazzo thing where you ascend a stone staircase to the piano nobile. To my surprise I was one of only a few visitors so could wonder around in peace. The place is absolutely stuffed full of paintings and every square inch frescoed and tromped. There are a many wonderful pictures, but I was after several rooms astounded by how much really bad painting had been done over the centuries! On average the decorative painting was better than the stuff in frames. So I wasn’t prepared when I entered a fairly small room and there it was. I had no idea that the picture was there so it hit me right between the eyes. To say the painting had presence was an understatement. I nearly said, “Whoops, excuse me!” And tiptoed out again. The picture of course is Velesquez’s great painting of Innocent X. This one is just a head study and is in the Washington Met. Though the studies are wonderful they don’t have quite the impact of the Rome picture. 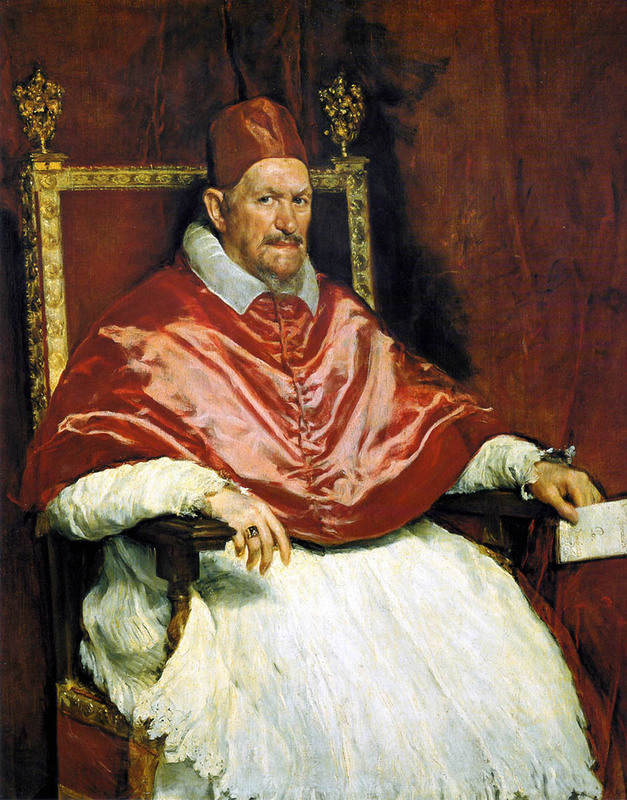 This is perhaps because of Velasquez brilliant structuring of the larger picture. Side to side the figure only just fits, indeed the paper held by the Pontif which holds the artist’s signature is cropped by the frame. The gilt work frame of the chair is broken by the Innocent’s head which both places the head in 3d space and anchors it in two dimensions. The background is an indeterminate russet then the chair fabric is a tad redder and then finally the Pope’s vestments a brighter red still. This progression pushes the figure towards us. All three reds are much the same in general hue which in turn gives harmony and subtlety. 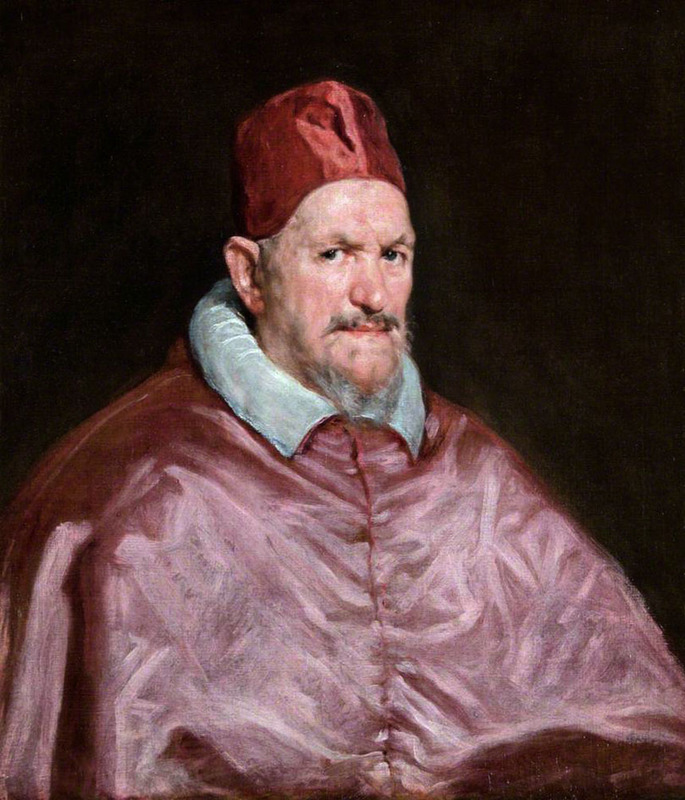 The white of the rest of the vestments is where I feel Velasquez has had to work hard, I suspect they got painted and repainted a fair few times. The brief crisp shadow of the red papal fanon on the white makes the pope’s upper torso appear the float. The clever shadow of the right hand and the arm of the chair fixes the casually posed hand in space. There is the merest hint of lace to suggest opulence but not excess. The hands describe a man who is relaxed. We cannot somehow imagine them fidgeting. They rest imperturbably on the fore-square arms of the gilded but rather severely formed chair. So to the head. 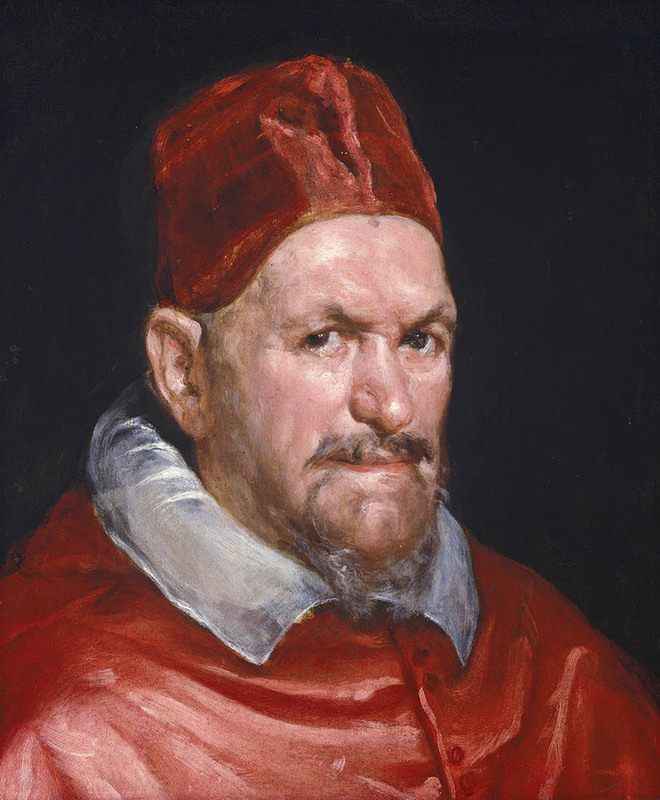 Innocent was a lawyer and had been a representative abroad to both France and Spain for previous pontiffs. Here is a face that has seen much and would be hard to surprise. Worldly, he had a mistress, but not prone to any excesses although occasionally cruel and capricious he was a politician through and through. He was not I suspect much of an art fan. 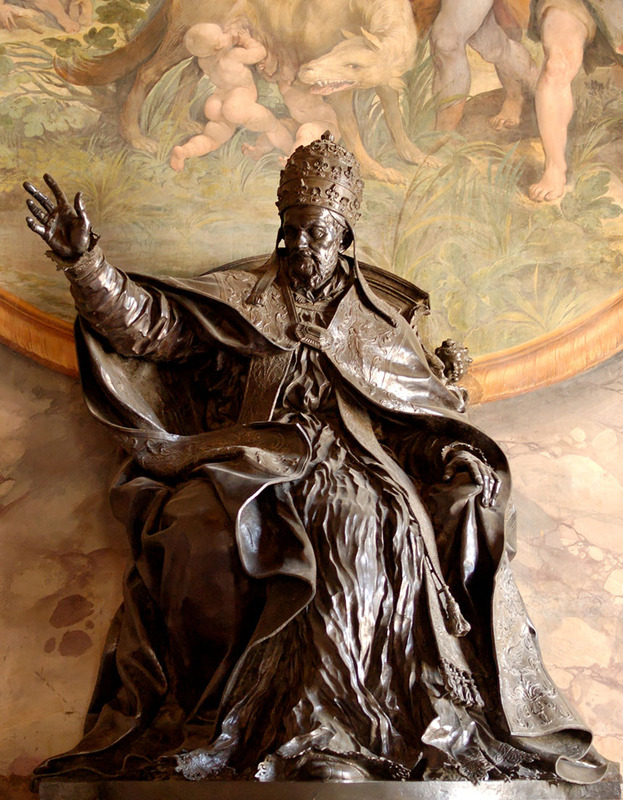 Although Bernini was closely associated with Innocent’s enemies the Barberini he was left in charge of the works in St Peters and did a fine bust of Innocent. So although reportedly paranoid and suspicious, a calculating, worldly and pragmatic man. Velasquez catches this by having the head held forward little, not tense but wary. The eyes consider us with, if we can believe the mouth, a wry edge of amusement. There is tremendous control of the edges. The hat is sharp and cuts across the forehead except as it approaches the ear where it is softened by hair. To the right of the brow there is a darkening of the gilt of the chair to pull the head forward. The line of the cheek is softened and wonderfully subtle. 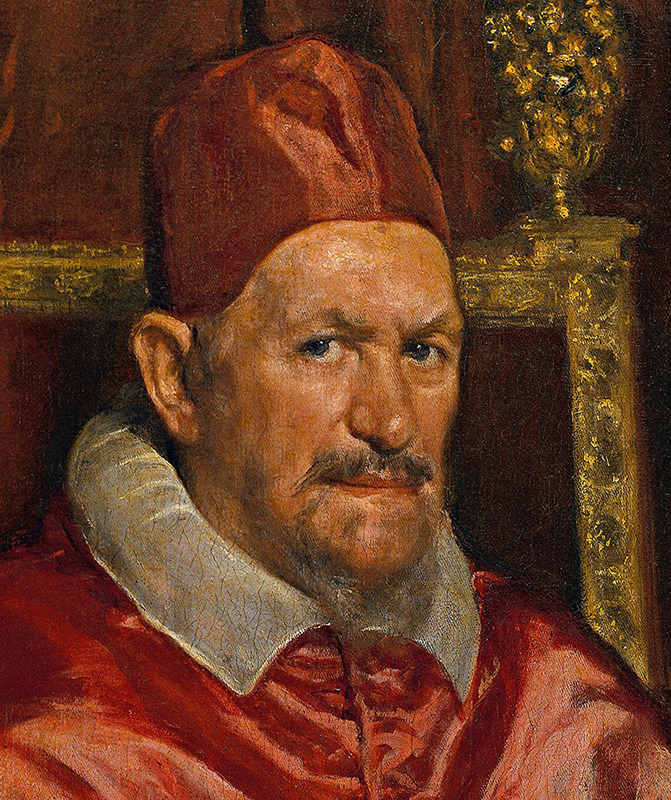 The shape of the chin is hidden by the Pope’s wispy beard. The collar cuts the neck sharply tone wise but the drawing indicates it is softly turned. The ear is strongly lit and describes the very slight turn of the head towards us. Velasquez has arranged it so the the eyes are turned further still which gives animation to the square on pose of the body. 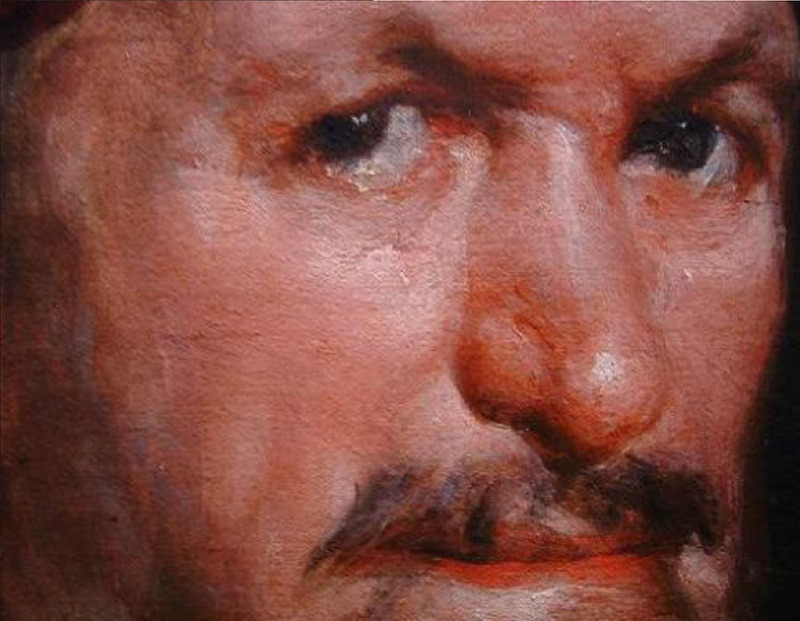 The features in themselves are ordinary, the fleshy nose the wispy beard, Velasquez has made no attempt to flatter. There is no real record of the Pope’s reaction to the painting, though rumour has it he commented, “It is all too true.” In any case the picture was hung in his family home where it still is today. Finally a detail of the Washington study. Many layers of refinement are visible but the whole remains fresh. He decides what should be clear and what obscure what marks of making should appear and which blended. For the sake of interest here is Bernini’s bust of Innocent. 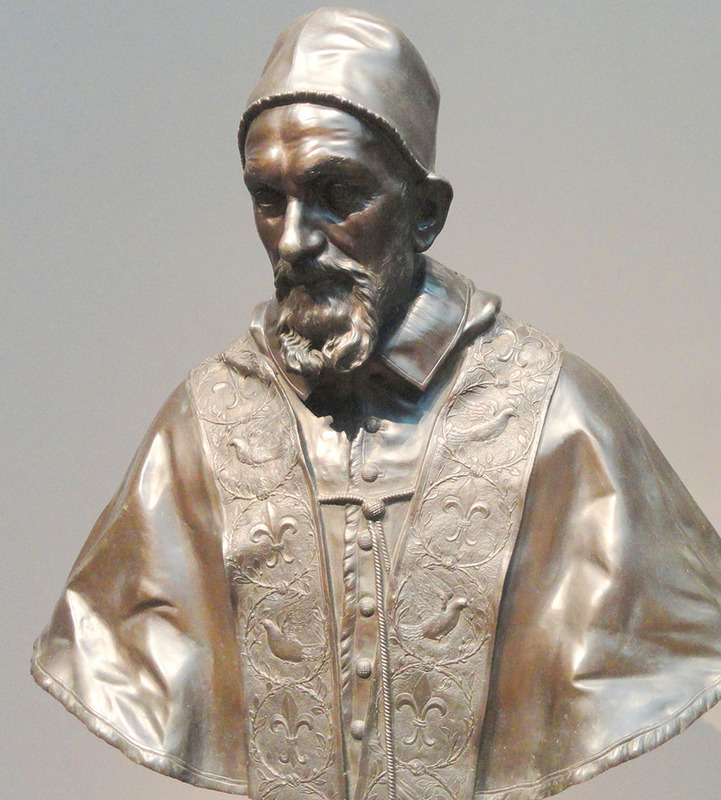 He is given a more youthful air, Bernini hopes to flatter I suspect. 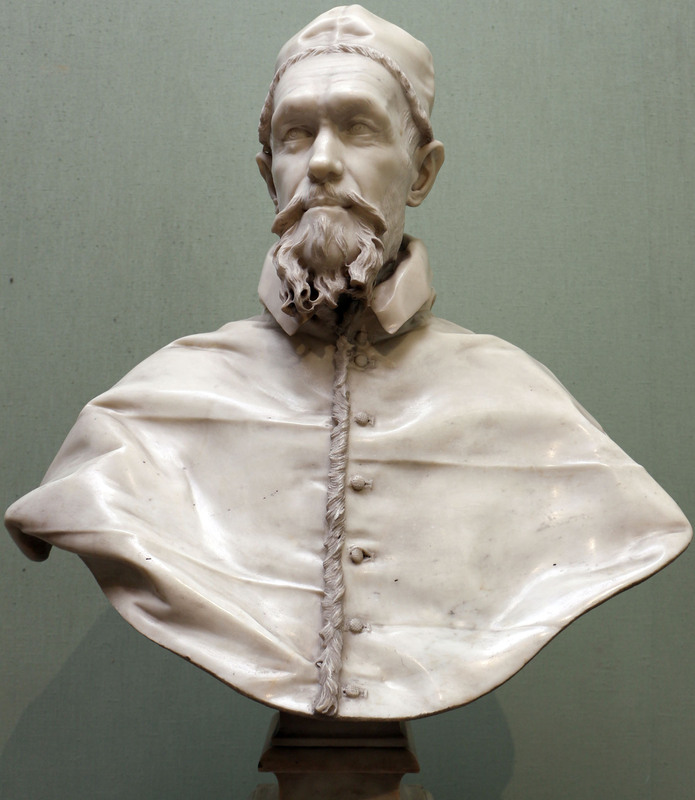 This bust also stayed in the Palazzo and was not for public consumption. This image was I suspect more how Innocent preferred to imagine himself, more in the mode of an apostle weighed down by his office. Now this one was definitely for public consumption!